Three new super-Earths “unlike anything in our solar system” have been observed close to us, just 54 light years away. The scientists were aided by an advanced automated robotic telescope – a technology expected to yield much more in the coming years. Let’s not pack our bags yet though – the three celestial bodies actually perform much more daring orbits around their host star than even our Mercury, taking 5, 12 and 24 days respectively. And we all know what happened to Mercury because of its close proximity to the Sun. “The three planets are unlike anything in our solar system, with masses 7-8 times the mass of Earth and orbits that take them very close to their host star,” Berkeley graduate Lauren Weiss said. The above findings are presented in the Astrophysical Journal. 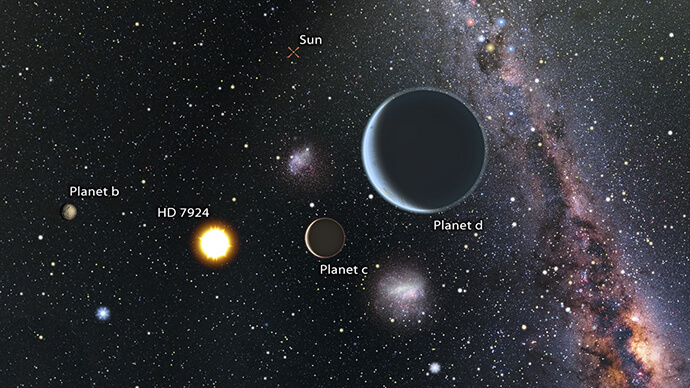 Although one planet was discovered back in 2009, only now have the scientists at universities in California, Hawaii, Arizona and Tennessee compiled a workable map of the neighborhood, where all three orbit their host star HD 7924. As with previously-discovered potentially habitable worlds, scientists measured the wobble in light caused by the bodies passing in front of their sun, which allowed them to estimate the size and trajectory of the bodies. To achieve this they used the Automated Planet Finder (APF) Telescope at Lick Observatory in California, the W.M. Keck Observatory on Maunakea in Hawaii, and the Automatic Photometric Telescope (APT) at the Fairborn Observatory in Arizona. The news APF facility is lauded by scientists for speeding up the process of planet-finding substantially. This is due to the observatory’s dedicated facility, armed with robotic technologies. The tools can work all night without human oversight and don’t ever get tired. Following one of the discoveries in 2009, a further five years of exploring followed. Then the APF Telescope came into play and completed the picture of the particular galactic neighborhood in a matter of a year-and-a-half. “We initially used APF like a regular telescope, staying up all night searching star to star. But the idea of letting a computer take the graveyard shift was more appealing after months of little sleep. So we wrote software to replace ourselves with a robot,” BJ Fulton, a graduate at the University of Hawaii, was cited as saying. One may remember the ground-breaking announcement of the Kepler program, which first brought to fruition the concept of measuring the changes in a star’s glow, as possible planets passed in front. Well, the APF continues the job with flying colors. Because, unlike Kepler’s thousands of Earth-like planets found all across the Milky Way, the APF’s discoveries are dramatically close to our own neighborhood. Scientists on the project are very optimistic about a more thorough analysis of that sector in the near future and anticipate new discoveries. These robotic observations are just the start of a new search campaign, which is part of Fulton’s doctoral dissertation. The new wave of robotic planet research will become a systematic survey of nearby stars in its own right. Two new Hawaiian facilities dedicated to this are currently being built. The APF is here to stay.